Leather care is just as important as the care of any other household item. When you finally have the leather couch that you have been drooling over for the past couple of months, you would want it to get damaged at all. But, with a house full of kids and frequent visits from guests, there is a high probability that your beloved leather couch or sofa may slit a little or begin to seem overused in just a period of 6 months. The repair of leather has traditionally, been a highly controversial and misunderstood subject. Most people do not even realize that leather can be repaired. Just like you took your time finding the perfect leather couches or covers for your car seats, you should also take your time finding the right leather care products to protect them. Leather, by its very nature, is a natural, organic product and therefore must be treated with products that are totally compatible in order to make a strong, durable repair that will make your leather last. Here is a list of some Leather Repair and Cleaning Kits that will help you keep your leather items healthy and looking new. Leather couch or leather covers add a lot of elegance and sophistication to your room, but taking care of leather is a tricky job. If it is not handled well, then there are high chances that it will wear out in a short period of time. However, with the Original Leather Repair Doctor DIY Kit, you can control and repair the damages to a large extent. It is a great product that works as a restoration solution for sofas, couches, chair, car seats, jackets, boots and other accessories. It is made up of high-quality paint and premium bonding adhesive that comes pre-mixed. There is no way that you can overdo or underdo the repair job. This repair kit is a non-toxic water-based solution that ensures long lasting repair. Q: Can I remove the excess adhesive after application? A: Yes, you can remove it before or after the solution dries. Q: Is there a color guide? A: Yes, there is a color guide in the package that you can use to match your desired color. Q: Does it take long to dry? A: No, it does not take a long time to dry as it is a water-based solution. If you have applied an excessive amount of solution, then it will take a little while to dry, but if you have used the right amount then you will have to wait for a few minutes before the repair process is over. It has an easy touch-up capacity with a vinyl surface. It works like a magic for cuts, rips, burns, and holes. This repair solution turns your damaged leather into durable liquid leather. There are no side effects or drawbacks of the product as per the customer reviews. 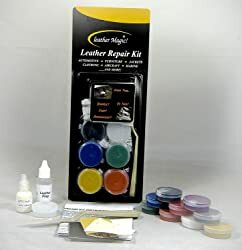 The Leather Magic Leather Repair Kit has greatly simplified the process of Leather Repair. It is designed to make permanent repairs to all types of leathers really quickly and easily. The repair compounds in the kit are made from water-based Polyurethanes which makes it compatible with all types and textures of leather. This repair kit is designed to perform repairs to small tears, cuts and deep scratches. 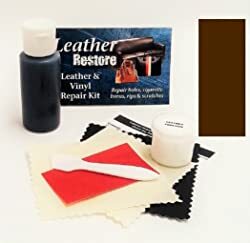 Leather Magic Leather Repair Kit is safe to use and have been developed to provide you with State-of-the-Art repair materials that truly make permanent repairs to damaged Leather. It is not made of harsh chemicals to avoid any damage to the surrounding leather. The whole repair process is extremely simple if you follow the instructions step-by-step. Once the solution dries, the repair compound remains soft and flexible to retain the natural look and feel of leather. There are 9 different colors in the repair compound to match with your leather items. There were no cons reported by the customers. This one is also a good repair kit when it comes to retaining the original color of your leather product. LeatherNu contains a genuine leather dye to touch up or recolor worn and faded spots on your leather goods. Cows don’t come in different colors, so the dye used to give unique colors to your good is a major component of this repair kit, which means you get to retain the originality of your favorite leather item. It is designed to work on the spots that have lost their color or faded away. Also, it works on the worn-off sections of the item. There is a professional repair compound in the kit that helps to deal with rips and cuts. The intermix color dyes are included in the kit to match with the color of your leather product because it is not necessary that your leather products are of natural colors. It is designed to work on any leather item you have; irrespective of their size and design. It has 7 intermix color dyes to go with your leather item. It repairs, cuts, holes, tears, burns, and punctures. Irrespective of how neatly it makes the repairs but is unable to give the same repair results on vertical surfaces. 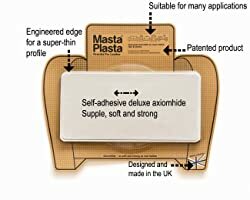 MastaPlastas are made from axiomhide that is considered a luxury alternative to real leather. It can handle hospital-strength cleaning agents but is as soft to the touch as the finest Italian leathers. It sticks to the leather and covers all the damages like they were never there. It is an easy peel-and-stick leather/vinyl repair solution that fixes all kinds of damages in just a few seconds. It is quite an effective solution that works on leather, vinyl, and many other upholstery fabrics. They are uniquely engineered patches with a pressed edge for the most smooth and neat finish. These patches are available in different sizes; also you can cut them according to size for awkward spots. It has a strong adhesive, easy to be used on curved areas. No obvious cons were reported about this product, but some people just don’t like the appearance of the patch as it does not seem pretty. 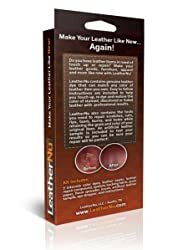 LeatherPlus provides you an affordable way to permanently repair leather and vinyl just like the pros. It has a repair compound that creates a permanent bond on the leather surface. With easy to follow instructions, it is not a big deal to get rid of unwanted rips and tears. There is no need to expose the repair to heat, as it is a quick dry solution. It works on car seats, furniture, jackets, belts, shoes and anything that is made of leather or vinyl. There are 7 intermixable colors with repair compound to go with different shades of your leather products. It has a matte finish, so it goes with most of the furnishing. It comes with very precise instructions which make it easier for the customer to use it. The kit comes with small portions of different colors, so it is always better to specify the color so you can use it over a large area. However, it always depends on your requirement. The Tear Mender TM-P-LRK Premium Leather Repair Kit is your solution for quick, easy and aesthetic leather repairs. It includes a 2 oz. 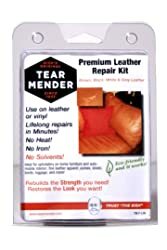 bottle of Tear Mender Fabric & Leather Adhesive and a repair patch that will quickly and permanently repair ripped, torn or cracked leather. You will have to use the surface renew compound; that is available in three colors to cover the repaired area. Also, you can blend the three shades to create the desired shade. This repair kit is designed to fully repair the damage in two hours. There is nothing to worry about machine wash if you are repairing your jacket or booths. This adhesive is compatible with machine wash. The quantity is sufficient enough to be used for more than 50 small repairs. As the adhesive is strong, you won’t need to apply a large quantity. It works on furnishing, leather apparel, and luggage. It does not require any external heat to dry out the adhesive application. It is quite sufficient in quantity. The compound comes in three colors only, and it is a possibility that you don’t find the desired color even if you blend the three shades. 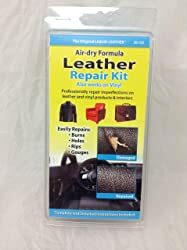 The company claims that their Leather Repair Kit repairs all types of leather and is available in a large variety of colors to go with your leather goods. 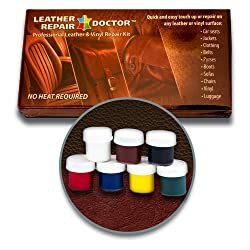 This means that you won’t have to run here and there to find matching color; all the basic and most used colors in leather good are available in the repair kit. With this kit, there is no need to mix and match different colors. The process of repairing is not some rocket science, you just have to fix the damage, then re-color, and your restoration is as good as new. There is no need of using any unsafe heat cure method, as the formula is based on air-dry. It is good to go with all repairs linked to apparels and accessories. Given the price, there are no doubts about the performance of this repair kit. It even works on burns along with rips and tears. 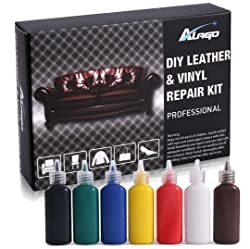 It is only available in black color, so if your leather product is something other than black, then you will need to buy some other leather repair kit. The company claims to make repairs in your leather damaged goods and make them appear like a new one once again. The company is based on the idea of repairing your leather items than just throwing them out in the waste or not getting them wear again just because there is an undesirable tear on the pocket. 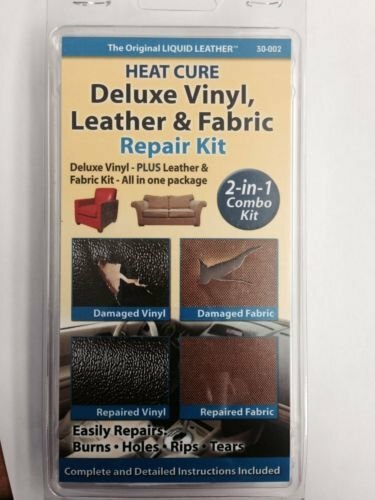 This leather repair kit does not require any external heat to dry the repair solution. The kit is well-equipped with 7 different colors of leather compounds to repair your damages on different items. It is quite a pocket-friendly item to deal with smaller damages on your own. Unlike many other repair kits, this works on burns as well. The color match guide in the kit makes you understand the right shades along with the process of blending more than one shade together to get the desired color. It has all the essential tools that you will need to do the repair job. A lot of users have reviewed the item to work better on apparel and smaller areas, rather than covering bigger cuts and holes on furniture. All Black Leather and Vinyl Repair Kit work on tears, cuts, cracks, gouges, burns, holes and scratches. It is easy to use kit that dries up in just a few minutes and your product becomes ready to use without waiting for long. This leather solution is water based which means it dries on its own, without the need of using any external heat. It is non-toxic and very easy to use. It does not take long to dry. This is a quick fix when it comes to leather apparel and seat covers. It has a pocket-friendly price. It is only available in black color which limits the usability. 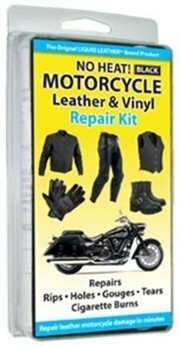 Invisible Repair Products Inc. has designed Liquid Leather Pro Leather and Vinyl Repair Kit that is based on re-usable grain papers. It is a bonding film that has 7 intermix colors. You can blend them together to get the desired shade. The adhesive is good to work on stuff like jackets and belts. It repairs your desired product in just a few minutes. The tools make it easier to apply the adhesive and also to let it dry for longer and better results. It comes with tools that do not make your hands or the workplace messy. It does not have a sharp irresistible smell. There is a verity of colors to match with your desired shades and items. It may not work on large areas like repairing a sofa rip or a hole in your car seat leather covers. Also, it is incompatible with a plastic resin that is used for repair. Leather goods are expensive, and you don’t want to pay even more money for replacement or for a professional service company. 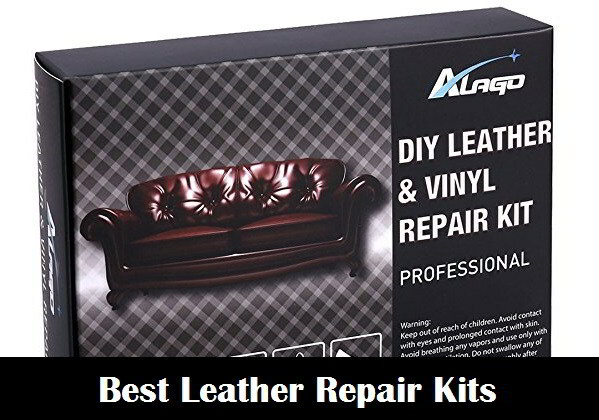 Save your time and money by doing the repairs on your own with any of the above-mentioned leather repair kits. We hope this article is going to guide you about the help you need regarding your damaged leather goods.